Oh Juliet! If there is one single goat who takes the prize for “Most Stories About Me” it’s Juliet by a landslide. No other goat even comes close to having caused as much mischief as she has. Her escapades alone could fill a small novel, but we love her dearly, and at this point, she is our most senior doe and has been with us the longest. She will always have a place with us, no matter how many shenanigans she gets up to. It’s tough to decide which of Juliet’s story is the best, but I do know which was the most amusing – and the most popular! The story of not only Juliet’s illegitimate child, but her theft of someone else’s kid as well! After Juliet produced the beautiful Moonstone, I was satisfied and decided to experiment a little bit with her genetics. I paired her with The CCF5 William the Conqueror and she was hand bred. She did not cycle again, always one to easily settle and become pregnant, and five months later, I expected to see some lovely little Nigerian Dwarf kids. Perhaps they would finally be the same beautiful blue as their dam – a color that still eludes me. Perhaps they would be cream like their sire. Part of the fun with Nigerian Dwarves is never knowing what one might get. However, I honestly did not expect what I got. It was a sunny morning when I went out to the barn for my first morning check. As usual, I located and scanned the kidding records, looking to see who had kidded in the hours I had slept after my late night shift. Seeing Juliet’s name, I was a little disappointed to see she had a single buckling, but since I already had a nice doeling from her, it wasn’t a big deal. I made my rounds, inspecting each of the kids and dams to ensure all was well, and eventually found Juliet in one of the kidding stalls, snoozing next to her newborn. I picked him up, and then frowned. This was not a Nigerian Dwarf kid. He was a Mini La Mancha! I was gobsmacked – how in the world had she managed to get in with Aslan? Because there was simply no denying it. The buckling was his spitting image, yet had his dam’s blue eyes. This was not a case of mistaken identity! Aslan, a purebred mature La Mancha buck, was so large Juliet could run beneath his belly with ease. How in the world had they managed this – especially since they lived in different pastures! Well – in the end, still not a big deal. A fun story. I scratched Juliet’s head and moved on. A week later, her little buckling went home with a wonderful family who fell in love with his cute little face and friendly nature. As the does often are, Juliet was distressed at the loss of her kid and called for him. This is one of the more unfortunate parts of my job, but reality means it has to happen. The majority of does forget about their kids by the next day, their attention turned instead to their now full time gig at the Dairy, and are just fine. Knowing Juliet would follow the same path, as she had before, I went to bed without concern. The next morning, I followed my routine. Kidding season was coming to a close, and now I was focused on selling and teaching the first fresheners what it meant to have a job. All was well and I was feeling content when I noticed Juliet standing, chewing her cud pleasantly – with a kid busily nursing beneath her belly. I admit it took me aback for a moment – hadn’t I sold him? Yes – I certainly had! I wasn’t going crazy quite yet. At least not that kind of crazy, as far as I know. I walked over and picked the buckling up. He looked extremely similar to Juliet’s original buckling – right down to the grey fur, the blue eyes, and the cute Mini Mancha elf ears. It took me just a moment to place him – he was one of Panda’s three kids. She herself was a Mini Mancha and had been bred to Aslan (on purpose). One kid was a stunning orange and white doeling who would remain with our herd, and the other two were bucklings – both of which looked similar to Juliet’s. I couldn’t believe it – she had gone and stolen someone else’s kid! While it was not unusual for them to share, and eventually even allow whoever pleases to nurse, they generally do not go out of their way to steal – at least not here! Why steal when you can barely escape the horde of kids running about? Amused, I gave the buckling back. Panda was likely relieved to be left with just two kids, as she never attempted to reclaim the buckling. I allowed Juliet to keep him, as everyone seemed content. However, there is just no room on the farm for extra bucklings, and he was eventually sold. Juliet seemed to accept this with good grace. And started nursing her year old daughter again instead. 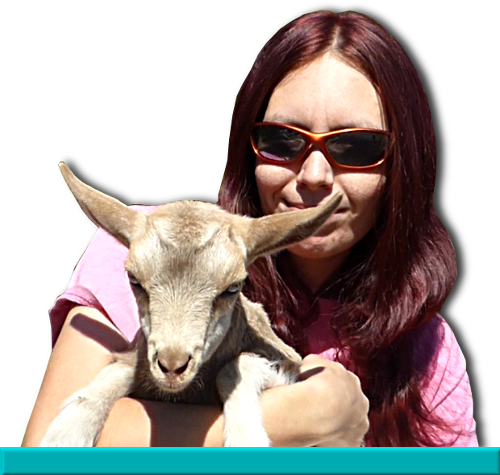 You all know how much I love to talk about the goats, and every single goat that has entered my life has had at least one story, so I’m going to do my best to write a few of them down for you folks to enjoy! I’m starting with one I promised to share, a story that shows so clearly that no matter how experienced you are, goats can still fool you. We were in the middle of kidding season, and Apple Blossom was sick. The delicate La Mancha doe had bad scours, an upset rumen, and a fever. I was thankful that she had obviously slipped her pregnancy early on – not only did her teats cling straight to her belly with no bag full of colostrum between them, but she was so thin she could have slid through the slats on a wooden pallet. Not to mention that I had personally palpated her, placing one hand in front of her under and pressing upward, searching for that heavy uterus, filled with fluids and kids. After years and handling hundreds of pregnancies, I was confident in my ability to discern a pregnant doe from an open one – at least most of the time. However, goats love to knock us down a peg or two when we grow too arrogant in our skills, and Apple Blossom took this opportunity to teach me a valuable lesson about assuming. It was quite a beautiful afternoon, and I was in my usual place, on my knees beside a laboring doe, sleeves rolled up and hair tied back. Crown Royal was faithfully pushing out twin bucklings with nary a grunt and I was mostly spectating, when I heard a sound behind me. I turned, not overly concerned – this time of the year, it was not unusual for several does to kid at once, and some of my most amused memories are of running from one to the other to ensure that all were progressing normally. But what I didn’t expect was to see Apple Blossom, down on her side, with two forelegs sticking out! I raced over and grabbed hold, too concerned about Apple Blossom to stop and marvel at this turn of events, and assisted with the birth of a black doeling. I had to pause to wipe away foul smelling scours off all three of us, hurrying to the hose to wash my hands the best I could before returning to check Apple Blossom for any more kids. I didn’t need to – I returned to find a second doeling, just as pitch black as the first, writhing in the hay. I stripped the amniotic sack from her and started to rub them both down as Apple Blossom lay unhappily in the bedding next to us. Realizing that she needed immediate attention, I scooped up both doelings, who were now attempting to walk and find a place to nurse, and took them to my house, where I settled them in a warm spot to dry. I returned to poor Apple Blossom and gave her everything I could to keep her comfortable, warm, and help her regain her energy after the surprise birthing. Before I finished, however, I stopped by Crown Royal, not only to check on her and her two healthy bucklings, but to fill a bottle with her abundant rich colostrum, that golden liquid that the doelings desperately needed if they were to grow up healthy. When I had done everything I could and separated Apple Blossom to a private warm place to recuperate, I returned to inspect these unexpected doelings. I was shocked to see that both were absolutely one hundred percent healthy normal sized La Mancha kids. I would never have believed that a doe as ill and thin as poor Apple Blossom could have carried and delivered kids that looked as good as these. She must have given every bit she had to them, to bring them into the world. I finished cleaning them up and fed them the warm colostrum, which both drank greedily, tails wagging. It wasn’t long at all before they were bouncing around my house, gleeful at being alive. Apple Blossom recovered well from the birthing, and though she had no milk, we returned the doelings to her and she was happy to mother them and clean their little bottoms as we bottle fed them. I was able to place all three of them, along with some of their friends, in a wonderful home, where Apple Blossom thrived away from the hubbub of a large dairy herd, and her doelings grew into beautiful does. It does my heart good to know that they are doing well, and to see pictures of them as they grow. What more can any breeder ask for – even when the kids are a surprise! Apple Blossom and her two daughters (now named Pansy and Petunia) taught me that one can never know what will happen next, and you can see why this is one of my favorite stories. Special thanks to Jana Wayne for providing updated pictures of Apple Blossom and her daughters.